This image was captured in early April. Nancy was in the front seat of a canoe. 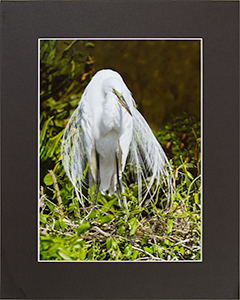 The great egret (Ardea alba) is the symbol of the National Audubon Society, which was founded to protect them from being killed into extinction to harvest their feathers for women's hats in the late 1800's. 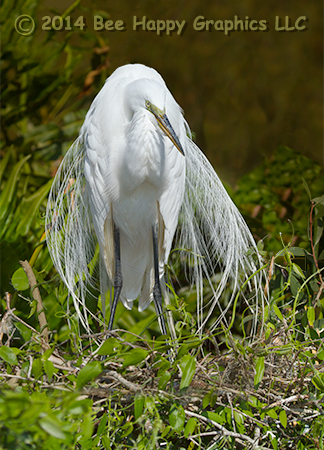 Both sexes grow long plumes on their back to raise in courtship displays during breeding season, but males perform most of the displays. Males choose the display area and build a nest platform before pairing up with a female. They may both collaborate to complete a nest that can be three feet across and one foot deep. Photographic details: Canon EOS 7D camera w/ EF 100-400mm f/4.5-5.6L IS USM lens set at 220mm. Off-camera flash was used. Camera was on f/8 for 1/1500 sec at ISO 200. Fine Art Paper 161/2" x 11" 311/2" x 23"
Canvas N/A 42" x 301/2"